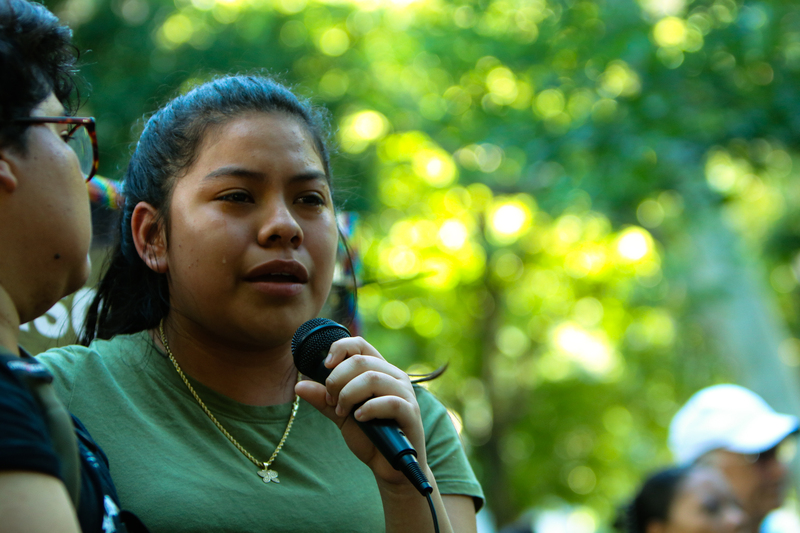 Keyri Artillero Apolonio cried as she recalled her experience seeking asylum with her family at the border in 2015. Her brother Fidel, who was 12 years old at the time, was separated from Keyri and their mother. Fidel, who immigration authorities believed to be an adult, was placed in detention with grown men where he was bullied. 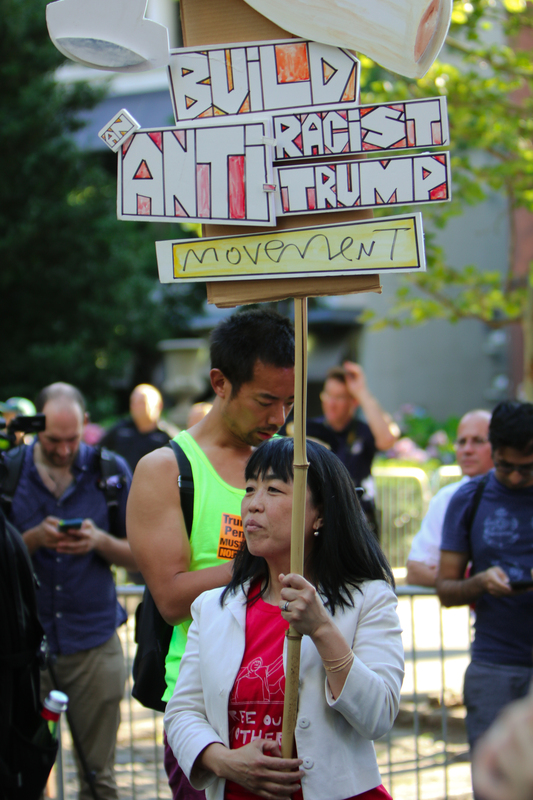 The siblings, whose family has been taking sanctuary in the Church of the Advocate in North Philadelphia since December to avoid deportation, were two of hundreds gathered in Rittenhouse Square on June 19 for a protest outside of the Rittenhouse Hotel, where Vice President Mike Pence was attending a Republican Governors Association fundraiser. 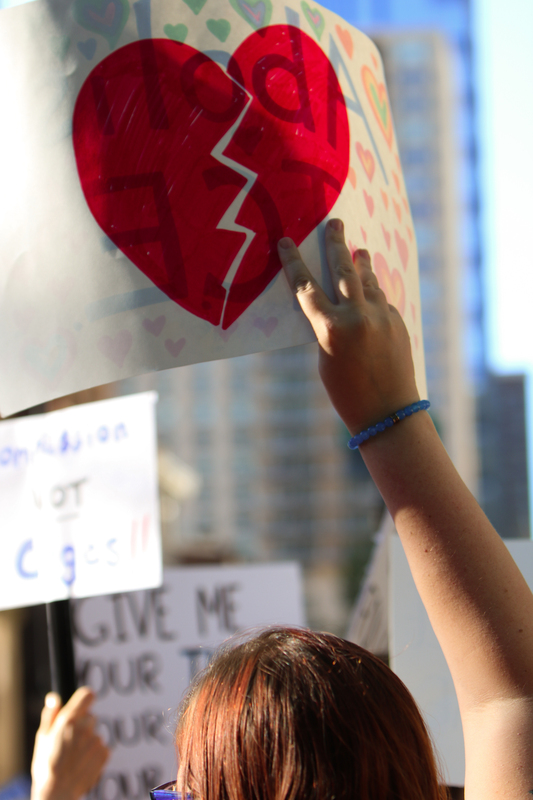 Demonstrators came to protest the Trump administration’s “zero tolerance” immigration enforcement that has led to thousands of family separations at the U.S.-Mexico border. 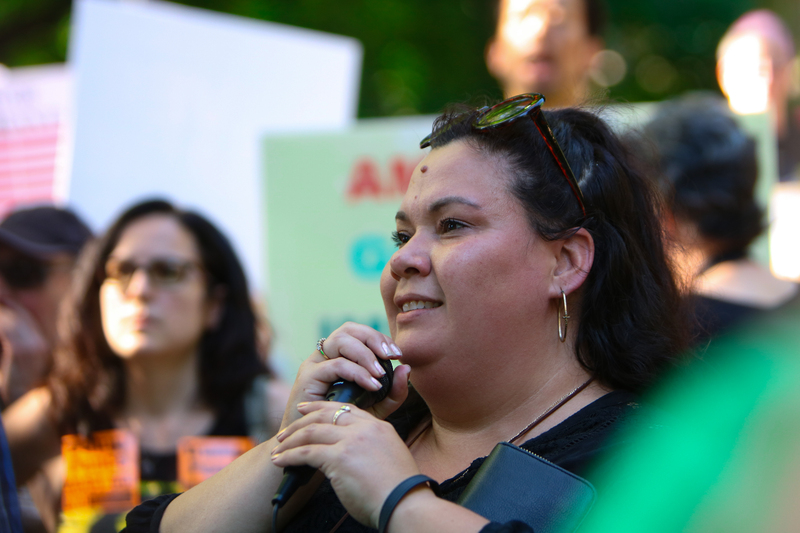 “We are out here, obviously, because of the inhumanity of having some of the city’s wealthiest donors toasting an administration that would rip children away from their families at the border,” Philadelphia Councilwoman Helen Gym said at the protest. The demonstration, organized by Refuse Fascism Philly and co-hosted by an array of organizations such as Juntos, The Coalition to Shut Down Berks and The Youth Caucus of America, was peaceful at first, until protesters attempted to occupy the streets surrounding the hotel despite police barricades and the vice president’s secret service detail blocking them off. One protester jumped atop a secret service vehicle that was attempting to move through the crowd and was detained by police. 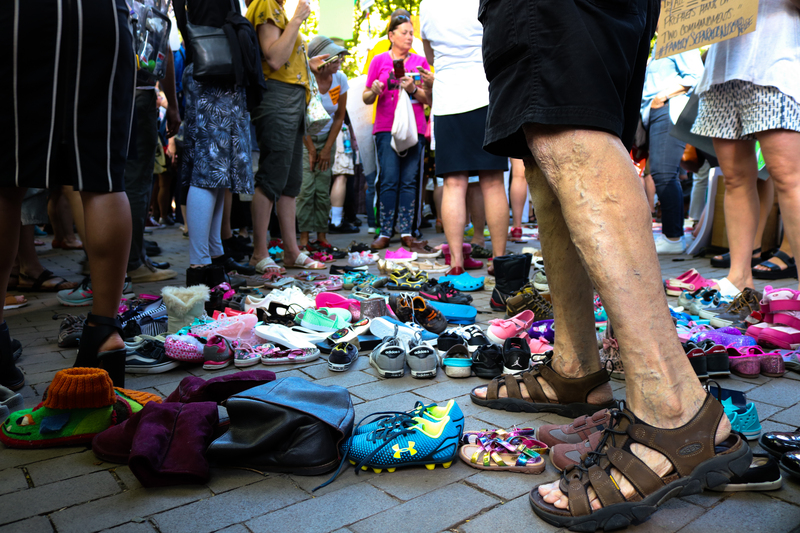 Demonstrators brought children’s shoes to the scene and spelled out “NO” on the Rittenhouse sidewalk to represent the nearly 2,000 migrant children who were separated from their parents during a span of six weeks in April and May while the adults undergo criminal prosecution for attempting to cross the border illegally. 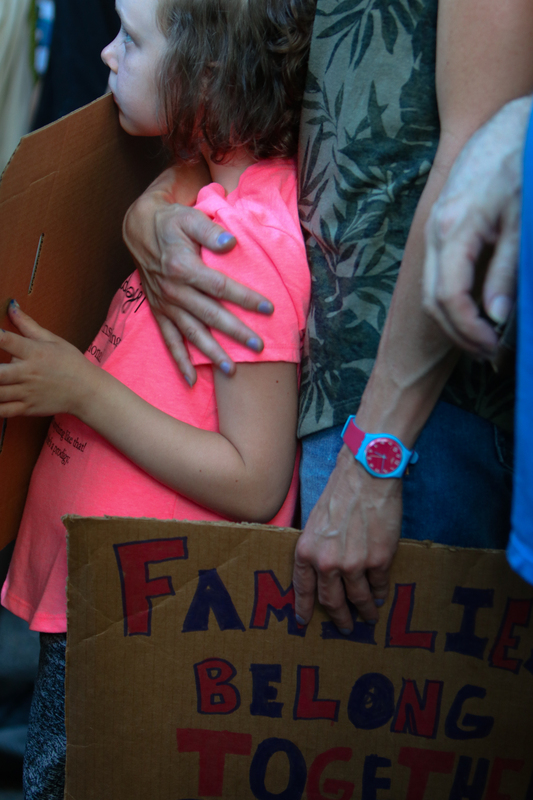 Like many parents who brought their children to the protest, Sarah Walters was with her two young daughters. Walters works with immigrants, teaching English to non-native speakers. 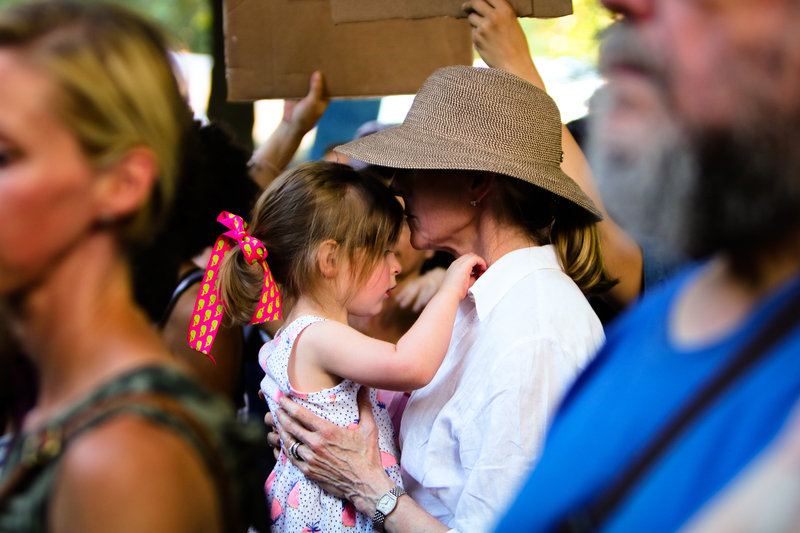 “How could you say that you're pro-family if you're separating families and who knows if these mothers will ever see these children again,” Terri Palmer, a protest attendee, said. 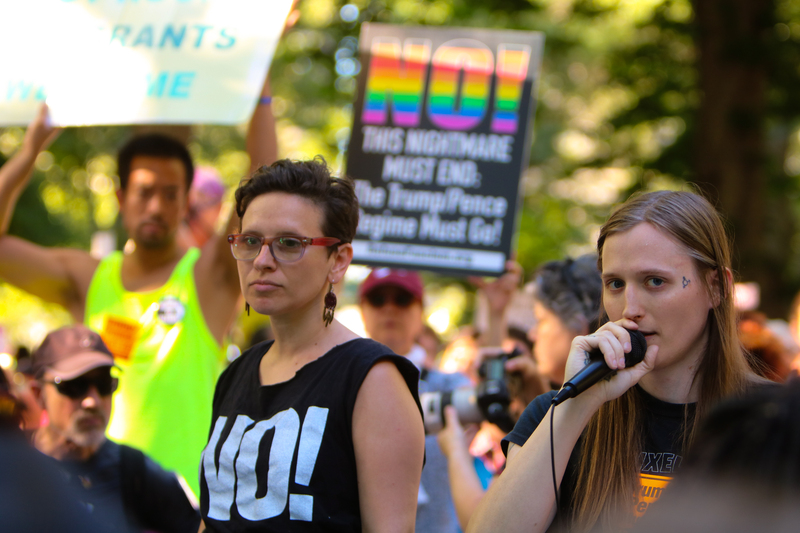 Representatives from Refuse Fascism Philly including Sunsara Taylor, a leader of the Revolutionary Communist Party (RCP), denounced the Trump administration’s policy and played the now-infamous soundbite of children crying in a U.S. Customs and Border Protection facility. 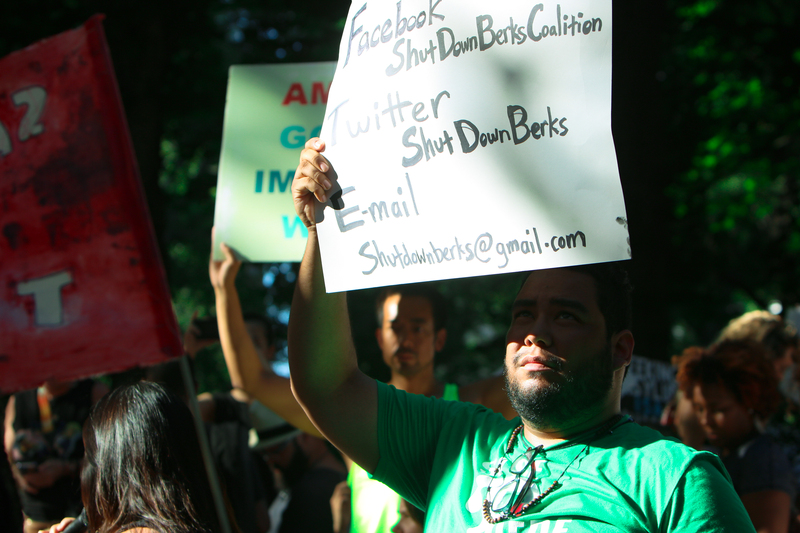 Executive Director of Juntos Erika Almiron and Jasmine Rivera from the Coalition to Shut Down Berks also spoke and were better received by the crowd, remaining focused on the cause of the rally: protecting migrant families. Rivera fiercely condemned the tendency to label the separation of families as an issue exclusive to Republicans and Donald Trump, when it has been happening for years under several presidents, she said. She called out sitting Democrats, namely Gov. Tom Wolf, to take action against the separation policy and the Berks County Residential Center. House Republicans vowed to get a vote in this week for two sweeping immigration reform bills that would end the separation policy and strengthen border security, both of which President Trump has agreed to sign. Senate Majority Leader Mitch McConnell said he will seek the help of Democrats to get it passed, but Senate Minority Leader Chuck Schumer immediately shot down the proposal, saying Congressional Republicans are incapable of coming up with a solution and that President Trump should be the one to address the separation issue.